View from the new dormer window! Completely renovated in 2014, The Boathouse is a beautiful, 2 bedroomed, 2 storey house which sleeps up to 5. With parking directly in front of the door you can just roll right into this fully equipped house. The Boathouse is warm and cosy with underfloor heating downstairs and panel radiators and a wood burning stove upstairs. A high chair, stair gate and a travel cot (please bring linen for cot) are all available on request, so ideal for all the family. Ground floor bedroom 1: with king size bed, bedside tables and wardrobe. Ground floor bedroom 2: with bunk beds and a single bed, bedside table and wardrobe. Ground floor bathroom: with bath, power shower cubicle, sink, wc and heated towel rail. Ground floor untility room: with washing machine, tumble drier and sink. First floor lounge area: with 2 x sofas, flat screen TV with freeview, DVD player, wifi and coffee table. First floor dining area: with dining table that will comfortably seat 5 people. First floor kitchen: is fully equipped to a high standard with fridge with freezer compartment, microwave, electric cooker, toaster and dishwasher. All electricity, heating and bed linen is included within the price quoted and towels can be hired @ £4 per set (1 x bath and 1 x hand) if required. We had another lovely holiday at the beautiful Boathouse. A wonderfully relaxing, warm and well designed home from which to explore the delights of Pembrokeshire. Our second time staying in the Boathouse. Beautifully presented, fantastic location and well-equipped, it’s a great place for a relaxing holiday on the wonderful Little Haven. Can’t wait till next year! A lovely, comfortable and spacious accommodation right in the center of the village. The Boathouse is very well equipped, a nice touch being the welcome pack of milk, tea, coffee, and biscuits. I am positive we will be returning. Thank you for our stay at the Boathouse this year. We enjoyed our holiday & as last year the property is a wonderful home from home. 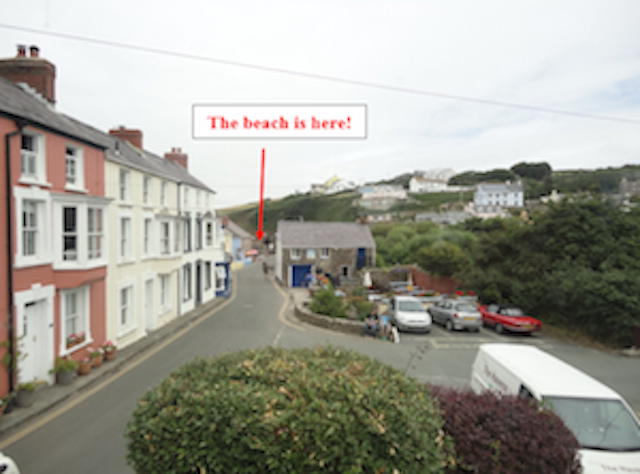 Little Haven is one of the prime locations in all of Pembrokeshire and always in high demand. This makes “ The Boathouse” a very special place to stay, the location is perfect for access to the beach, excellent local pubs and the coastal path. The quality of accommodation is first class, modern , comfortable and beautifully presented and Karen and her team manage the administration of your stay really easily from start to finish. We have thoroughly enjoyed three visits and this will always be our first choice. Gorgeous immaculate house, log burner very welcoming fantastic week in Little Haven. Used Stay In The Havens many times, houses always perfect. Recommend you to all our friends and family. Yes, we had a very comfortable stay in The Boathouse. It is equipped to a high standard, the kitchen and bathroom being of particular note. Thank you for leaving the complimentary milk, biscuits and drink sachets. They were a welcome surprise after our journey from Bristol. We had a lovely break in Little Haven and The Boat House was great - modern, clean and well equipped. We would recommend Stay in the Havens as this is the second property we have stayed in and both have been of a very high standard. We had a lovely time in the Boathouse. It is very well-equipped, and comfortable and ideally situated in the heart of the village of Little Haven. The coast path virtually passes the door, and there are many fine ways and places to visit within easy distance of the property. Highlights included the bracing early morning walks over the hill to Broad Haven to get my newspaper; walks around Dale, Bosherston and Stackpole Quay; and a delightful walk from Broad Haven to Haroldston. The coast and surrounding countryside are beautiful, and we had a relaxing as well as energetic time. Recommended. What a perfect little house, so cosy and well appointed. We enjoyed our stay very much. Thank you for this wonderful time in Little Haven. We had a great time (shame about the weather!!) - thank you very much! The house was warm, cosy, comfortable and well equipped and we’d definitely recommend it. The location was great - just a short walk to the sea! Also we’d like to say how helpful you were - we have always had very prompt and helpful replies to our emails and it was definitely above and beyond what we could expect for you to get our parcels to us! Yes, we enjoyed our stay very much thanks. The Boathouse was clean, comfortable and well equipped and Little Haven was an excellent base. PS Thanks for getting the downstairs sink sorted out so quickly! We had a lovely time at the Boathouse, the location for beaches are superb, and the walks were so scenic and pleasurable (a walk every night took in the UFO hotel, just in case). One tip we would pass on, if you want to eat in a local pub, book early especially Friday night as all were fully booked. We shall return. We had a lovely stay in The Boathouse, Little Haven. We enjoyed swimming, surfing and walking the coast paths and then returning to a comfortable and relaxing home with a warm and stylish bathroom and a well-equipped kitchen. A lovely space for a family holiday. I've recently returned from a stay in 'The Boathouse' in Little Haven. I would like to say what an enjoyable stay it has been. The property is very clean & presented with everything you need from a holiday cottage to make your stay enjoyable. I would like to add that I have found Karen very helpful & easy to deal with when booking with her. I will certainly look to stay in one of her properties next time I am in the area. Many thanks again, Karen. Thank you for a lovely holiday, we really enjoyed our stay at the boathouse, we found it very comfortable, spotlessly clean and very well equipped. It is situated in a lovely spot in Little Haven just a short stroll from the beach and 3 great pubs who all serve excellent food. We love Pembrokeshire but this was our first stay in Little Haven and we will definitely be back. Fantastic coastal walks and brilliant coastal bus service that gives you the opportunity to explore different stretches of this beautiful coastline by catching the bus and walking back. We very much enjoyed our second stay in The Boathouse, it is comfortable, spacious and well fitted out, and the location is superb. We've been visiting Pembrokeshire since childhood and never tire of its beauty and charm. Having stayed in many places we've found The Boathouse perfect! The package has everything well thought out and presented. Will certainly return. Thanks to the owners and to Karen and Claire for managing. Perfect location, beautifully equipped and furnished, fabulous walks. Run by friendly and helpful people. Top all round - see you next time! Thank you for a lovely stay. Can't recommend Little Haven highly enough. Locals very friendly. Pubs brilliant. Ate at Swan on the first night - portions massive! Whitebait and sweet potato fries at the Castle were amazing! Seals at St Martins Haven a must see. The Boathouse is amazing - well kitted out. We will be back!! Lovely and comfortable space - the promised pint of milk was missing - but a minor hiccup. We felt very at home. The food and service at The Swan is superb. We wish you every success as this is a lovely let in a lovely part of the world. A wonderful house in a perfect location for walking the coast path. The Boathouse is a beautiful gem so lovely our Ruby Anniversary will be remembered. Thank you so much. Such a beautiful living space - perfectly designed to feel relaxed in - thank you!